Almond milk is even better when you make it yourself at home. Skip all those boxes and preservatives and get the delicious, satisfying flavor of nut milk. You have your choice of easy, or easier with these two almond milk recipes. One requires soaking the nuts in advance, and one doesn’t. They are both tasty. The “cheater version” is best enjoyed straight away. 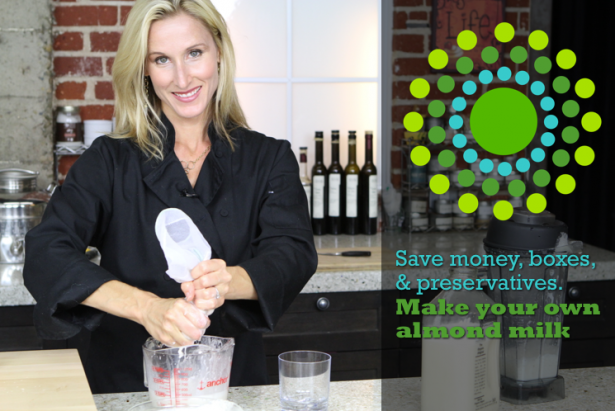 Here is the video on how to make almond milk. Below the video you will find both recipes. Enjoy! Blend all ingredients in a Vita-Mix or other high speed blender until smooth. Strain through a nut milk bag into an airtight glass container. Will keep in the fridge for up to 5 days. Blend all ingredients in a Vita-Mix or other high speed blender until smooth. No straining required! Keeps in the fridge for up to 5 days. Get more fast, easy raw food recipes in the raw food detox diet, Rocking Body Raw Food. Take a tour of this weight loss detox program by raw food video chef, Joy Houston that includes hundreds of video tutorials, easy menu plans, shopping lists, and recipes. If you are ready for a weight loss detox diet that works, tastes great, and involves eating delicious foods and no starvation then this is the weight loss detox for you. What will you look like in your Rocking Body? OMG I am going to try this and save me some money at the grocery store. Thanks much. What kind of vanilla do u use? Is it vanilla extract or vanilla essence r vanilla syrup? nut milk bag be reused? Do you recommend a specific type or brand for nut milk bag? You do realise you’re a genius?!!! I just made this and OH…MY…GOD! It was so creamy and amazing, the vanilla and dates were delicious in it, almost like a milkshake in itself. Best recipe by far, so many others are thinned down too much/too lengthy a process etc. Not to mention how much cheaper this is than store bought. Keep up the good work! How many ounces/mLs does the old school version make? Does the almond butter have to be raw? I like mine roasted. Quick question: since you’re doing this on a high speed blender (I have the vitamix too), wouldn’t it be easier to make almond butter in the blender first, and then add water to it to make the milk? That way, no mess and plus you get all the protein and fibre. Is there something I’m missing, perhaps the nutrients in the pre germinated seeds? I am very grateful for your video and post, I found today..looking forward to learn from you since I have a ton of weight to drop and looks yummy . Will look for your almond butter recipe as well , have a blessed week ahead. Can you recommend a raw almond butter that can be ordered online? The options I’m finding have added oils and salt.